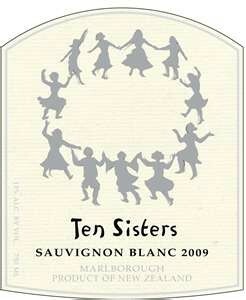 This is our Number One Selling Sauvignon Blanc 4 years running! This single vineyard (that’s right single vineyard!) Sauvignon Blanc is much better than any Sauvignon Blanc I've tasted in its price point ... I wouldn't be surprised if you started hearing about Ten Sisters in the same breath as well-known, established labels such as Kim Crawford and Cloudy Bay ... This is a very polished and refined wine with a long finish – everything is in balance. "Mandarin and grapefruit on the nose. A rich and luscious palate of tantalizing passion fruit, guava, white flowers and shiso leaves. A lingering finish."